Patrick Geddes is one of the most important figures in planning history, variously presented as an inspiration to regional planning, environmental planning and sustainability, grass-roots planning, citizen democracy, historic preservation, neighbourhood upgrading, university–community partnership, lifelong learning, and co-operative housing. Though well-known and often praised by planning historians, his scholarship extended across a much broader range of disciplines, with extensive publication on biology and on civics, and significant contributions to sociology, economics, geography, education, and the arts and humanities. With the exception of his plan of Dunfermline, published in 1904, his plans are very hard to find. Most of his plans were prepared in India between 1915 and 1923, but beyond brief extracts from four of them included by Jaqueline Tyrwhitt in the book Patrick Geddes in India, they are very difficult to obtain. Some are lost altogether and the remainder are available in a handful of libraries, often held in Archives. 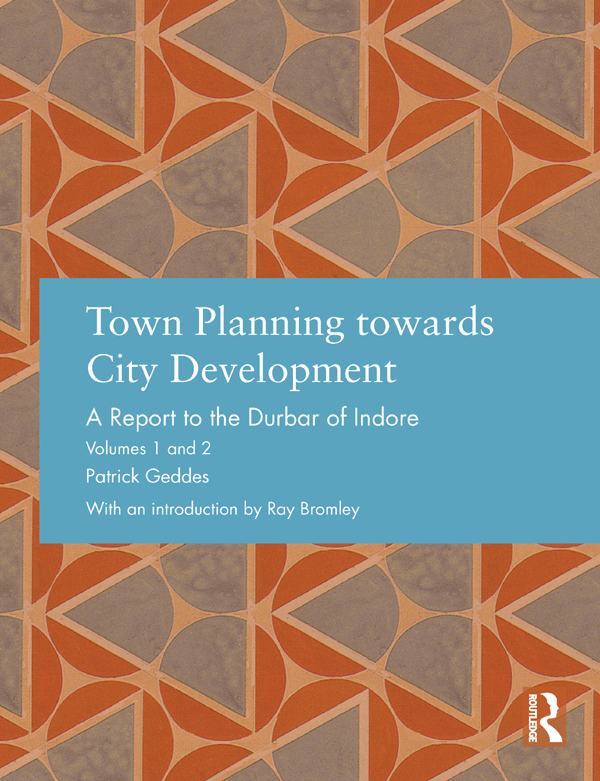 Of all the plans prepared after Dunfermline, the most extensive is for the city of Indore, originally published in two volumes that combine a comprehensive scheme for the urban development of the city with a detailed plan for the proposed University of Central India. Estimates Continued: New Communications etc. Housing Forecast, and Building Estimates, for Industrial Town etc.